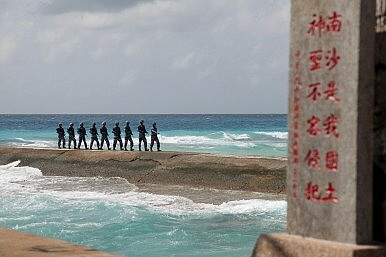 Soldiers of China's People's Liberation Army Navy (PLAN) patrol near a sign in the Spratly Islands, known in China as the Nansha Islands, February 9, 2016. The sign reads "Nansha is our national land, sacred and inviolable." How China seeks to shape maritime law to legitimize its claims. The strategic pause, while the PCA considers all legal arguments, offers an opportunity to examine the legal implications of China’s maritime sovereignty claims in the SCS – particularly as they relate to the delimitation of maritime zones, assertion of sovereignty over geographic features, and permissibility of military activities in the exclusive economic zones (EEZ). By doing so, one can appreciate more the legal complexity and nuances being considered by the Tribunal and better understand the ramifications of the looming merits ruling to the claimants, greater region, United States, and the world order (international rule of law). Then the geopolitical discourse can be examined by speculating how the PCA might rule in the arbitration case and then identifying potential U.S. strategic opportunities as the result of the ruling. What Do China’s Legal Opinions Say About Its Maritime Sovereignty Claims? China contends that the arbitration case is not about interpreting the United Nations Convention on the Law of the Sea (UNCLOS) with respect to maritime claims, but about the territorial sovereignty of those claims, which UNCLOS has no authority to determine. Moreover, the Tribunal itself does not have jurisdiction to determine sovereignty over geographic features in the region because its jurisdiction is limited to matters concerning the interpretation and application of UNCLOS, and again UNCLOS does not contemplate sovereignty. Lastly, Beijing asserts that Manila violated prior bilateral agreements — specifically the 2002 Association of Southeast Asian Nations (ASEAN) Declaration on the Conduct (DoC) of Parties in the SCS — to settle maritime disputes with China through bilateral negotiation and not international arbitration. Last October, the PCA largely rejected the aforementioned Chinese legal arguments. The Tribunal instead acknowledged the preeminence of UNCLOS in determining maritime rights and resolving maritime disputes; refuted Beijing’s refusal to participate in the case as an end to the UNCLOS dispute settlement process; declared that the ASEAN Treaty of Amity and Cooperation and DoC do not preclude any parties from seeking third party arbitration; and accepted the Philippines’ legal assertions that its 15 submitted claims only concern the interpretation and application of UNCLOS, not the various sovereignty claims throughout the SCS, and are consequently subject to arbitration. In short, Manila will have its long overdue day in international court as the PCA deliberates and makes its merits ruling in the coming weeks. To further complicate extant legal and political matters, Taipei has reaffirmed that its claimed and occupied island of Itu Aba meets the requirements for an island (versus a rock) under the articles of UNCLOS and consequently entitled to a 200 nautical mile Exclusive Economic Zone (EEZ). This is not a trivial legal matter. The legal status of Itu Aba, the largest natural feature in the Spratlys, will be an important factor in the Tribunal’s deliberations and have strategic ramifications for Taiwan, China, and the other SCS claimants. If Itu Aba is ruled a rock and not deserving of an EEZ, then it is likely that the PCA will rule the same for the remaining geographic features in the Spratlys – hence significantly restricting the maritime rights any claimant is entitled to based on occupation and administrative control of those features, and benefiting greatly coastal states like the Philippines, Vietnam, Brunei, and Malaysia. If, however, Itu Aba is ruled an island and entitled to an EEZ, then the attending maritime entitlements would cover much of the Spratlys. And, because the Tribunal cannot determine sovereignty, it would give an opening to the other SCS claimants – including China – to claim that EEZ. Therefore, Beijing could continue to have a credible claim to a large swath of the SCS – albeit through Taipei. All in all, China’s legal brief to the Tribunal is the latest manifestation of its legal warfare strategy – the strategic use of law and legal claims to accomplish or oppose a national or military objective. The strategic aim is to maintain a lack of legal clarity regarding maritime delimitations and the sovereignty of various geographic features in the SCS. That legal ambiguity causes the other claimants to hesitate and pause, and permits Beijing the freedom of action to further promote and assert its maritime sovereignty claims through other means. Put simply, China asserts and promotes claims, creates facts on the ground to support those claims, and then shapes maritime law to legitimize the claims (fait accompli) to include the delimitation of maritime zones, assertion of sovereignty over geographic features, and permissibility of military activities in the EEZ. UNCLOS modernized the scheme of maritime zones extending from a state’s coast. Article 3 provides a territorial sea of 12 nm. Article 33 allows a contiguous zone of 12 nm beyond the limit of the territorial sea, in which states can engage in law enforcement activities related to customs, immigration, and sanitation regulations. Article 57 establishes the EEZ for 200 nm of adjacent waters. Finally, Article 76 permits the declaration of a continental shelf further than 200 nm but no further than 350 nm from the coastal state’s baseline. Each of these zones is determined by the state’s baseline in accordance with the provisions contained in Article 5. Beijing tries to reinterpret these provisions by claiming unwarranted maritime zones through excessive strait baselines, unlawful archipelagic baselines, and vague rights based on historical waters. To sum up, China ultimately seeks to separate swaths of ocean for its exclusive economic development and create de facto demilitarized zones in the middle of the SCS for military purposes. China’s contested nine-dash line claim is a textbook example of an unwarranted maritime zone largely based on historical water rights. The theory of historical rights pertains to a few circumstances, to include adjusting a maritime boundary based on historical fishing practices, establishing an archipelagic state, and conducting passage through the straits. There is no legal basis for an historical rights claim to a EEZ. Nonetheless, Beijing still asserts that it has strong evidence to support its claims to historical rights in the SCS, but has provided very little proof and the little that it did provide lacks historical and geographic consistency and precision. Moreover, documented historical evidence indicates that the seas in the region have been common fishing grounds and trading routes for many regional peoples, and not just the Chinese. Indeed, that evidence, as well as evidence of the inhabitability of the geographic features that China claims under historical rights, greatly diminishes Beijing’s ability to meet the standards for historical water rights as laid out by the International Court of Justice in 1951. As previously stated, the crux of Beijing’s legal argument is that the arbitration case and most, if not all, the maritime disputes in the region revolve around territorial sovereignty. Therefore, the question of sovereignty over the various geographic features must be answered in order to resolve the questions of territorial seas, EEZs, and baselines because the nature of the feature determines whether it is entitled to certain maritime zones and the sovereignty of the feature is responsible for declaring baselines from which maritime zones are drawn. However, before concluding which nation is sovereign over the disputed geographic features in the SCS, it must first be determined whether those features are islands or not. Under Article 121, to be an island requires being an area of naturally formed land surrounded by water and above that water at high tide. Additionally, an island must sustain human habitation or economic life of its own, or else the feature constitutes a rock and not an island. The significance lies in that an island supports both a territorial sea and EEZ, but a rock supports only the former – a significant difference in surface area (400 vs 120,000 square miles). Nevertheless, despite the international legal standing (UNCLOS) that a submerged feature or low tide elevation cannot be turned into an island that warrants maritime zones, China still insists its various geographic features are islands and creates facts on the ground to make them islands, as is the case now for many of the new land outcrops and improvements in the Spratly Islands. The international standard for sovereignty over these geographic features requires a state to demonstrate effective occupation or continuous administration and control. China’s actions to date work toward meeting this standard, and the longer it can continue to engage in those actions the stronger its legal arguments for sovereignty become. In other words, it is in Beijing’s best interest to maintain and prolong the status quo over the features it claims and controls. The ongoing land reclamation efforts, continuous occupation, and routine maritime patrols are all designed to buttress its nine-dash line claim in the SCS. The Chinese argument on the permissibility of military activities in the EEZ is legally expansive and evolving. Beijing contends that military activities on the high seas and in the EEZ are unlawful based on the legislative spirit of UNCLOS and a requirement from that treaty that the high seas be used only for peaceful purposes. Though the language in UNCLOS mentions only the high seas, Chinese legal scholars further assert that military activities are unlawful in an EEZ as well. The logic is that if UNCLOS requires states to use the high seas only for peaceful purposes, then foreign activities in an EEZ (a special area governed by the coastal state) must also be peaceful and so contradicts military activities, which are inherently not peaceful. American legal scholars have countered that military activities have been a recognized lawful activity on the high seas and in an EEZ under customary international law. Military activities are done in the exercise of freedom of navigation, which is preserved under Article 58. China, on the other hand, classifies the mission of military survey ships as marine scientific research rather than military survey activity. This interpretation is also an expansive reading of coastal state authority in an EEZ. Under UNCLOS, states have sovereignty and regulatory authorities over marine living resources and environmental protection, as distinct from marine scientific research. China interprets this distinction as meaning all remaining activities, and those which are not resource development, constitute part of marine scientific research, to include military survey activities. The result of this narrow interpretation is to permit the coastal state to regulate all activities within its EEZ. That being said, Beijing’s interpretation seems to ignore UNCLOS Article 58, governing the rights and duties of other states in the EEZ. Indeed, the article explicitly states that the right to freedom of navigation, as well as the freedom to engage in internationally lawful uses of the sea related to overflight and laying of submarine cables and pipes, are also effective in a coastal state’s EEZ. Thus, while the article’s language does not include reference to military activities, it can be inferred that military survey activities are one such freedom related to the aforementioned authorized activities. This concludes Part 1 of a two-part series on China’s maritime sovereignty claims in the SCS. Part 2 (coming Friday) will pick up the conversation with what to expect from the long-awaited PCA merits ruling, and more importantly, what the United States can and should do in its legal wake. Captain Tuan N. Pham is a career U.S. naval officer with extensive operational experience in the Indo-Asia-Pacific, and a former Federal Executive Fellow at Johns Hopkins University Applied Physics Laboratory. The viewpoints expressed in this article are personal, and do not reflect those of the U.S. Department of Defense or Navy. A look at China's position on the case -- and how it could respond if the tribunal rules in the Philippines' favor.